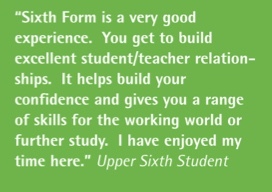 Thank you for your interest in our Sixth Form here in Priory Integrated College. This website contains information about all of the courses available to students who choose to pursue their A Level studies with us here in the college. I hope that you find the information useful as you begin to make your decisions about what you want to do once GCSEs are over. 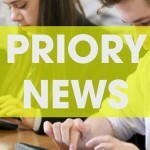 Excellence for All is at the core of our mission and purpose here in Priory. Our Sixth Form is therefore organised to ensure that we meet the needs, interests and aspirations of all of our young people. We offer a range of general and applied courses which offer progression routes to higher education and employment. Courses are delivered by staff here in the college and in collaboration with our nearest neighbours, Sullivan Upper, as well as with other schools and education providers in the North Down Area Learning Community. 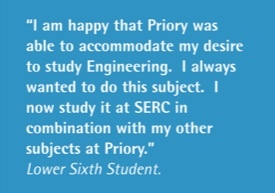 Students who wish to continue their education beyond GCSE have a wide range of courses to choose from here at Priory. Whatever your interests and aspirations there is something here for you. Most of our students in Sixth Form study at least three A levels (or equivalent) throughout Years 13 and 14. A smaller number of students enrol on our 2 A level package. If you enrol on a course at the beginning of Year 13, our expectation is that you will continue to study that course for the duration of your time with us. We also offer a range of enrichment programmes, trips and activities, which help you to develop a range of skills, promote the integrated ethos of our college and make the provision in Sixth Form an enjoyable and enriching experience for you. 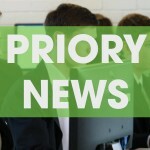 Pastoral Care is at the heart of everything we do here in Priory, and this is no different when it comes to our Sixth Form students. 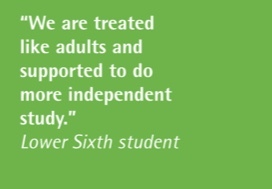 We aim to ensure that you are supported through the challenges of academic study at this level, and our Sixth Form pastoral team work closely with parents / carers and the wider community to ensure the highest possible quality of care for all of our young people. As a result, the outcomes for our young people who complete their Sixth Form studies with us are simply outstanding, with many of them going on to university here in Northern Ireland or elsewhere throughout the United Kingdom and the Republic of Ireland. Others secure employment in one of the many growing industries here in Northern Ireland. If you would like to know more about us, please attend our Sixth Form Options evening on 14th March 2019 7pm – 8.30pm in the College Assembly Hall. We understand that the decision about which subjects to study may well be a difficult one for you. We have an exciting range of courses on offer at Priory, so making your choices does mean that you will need to give it careful thought. •Read the details about the subject specifications very carefully. 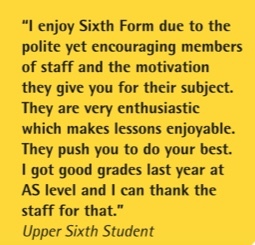 •Talk to your subject teacher/s about the subject at Sixth Form Level. Do not assume you know about a subject just because you have done it at GCSE. •Look at the content and pattern of assessment. •Talk to your teachers about your choices. •Be aware of your predicted grades at GCSE and read the Entry Requirements for each subject carefully. •Talk to the Careers Teacher/Adviser, particularly if you have a specific career in mind. Some careers specifically request certain subject combinations and it is important that you know this before you embark on your course of study. •Read University Prospectuses looking at degree courses which may already interest you. Think ahead as some degree courses favour certain subject combinations. Sixth Form Staff will also advise you about University requirements. The UCAS website is a useful starting point for any research. 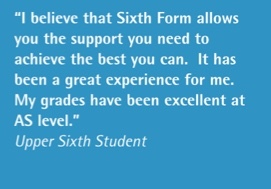 Feel free to visit the Sixth Form Centre or use our library. •Talk to your parents about your intended choices. 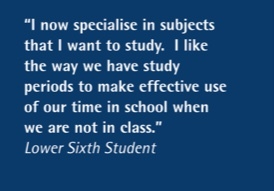 They want you to be successful in your Sixth Form choices so involve them in your decision-making. •In listening to the advice given, you must remember that it is you who will be following the courses. The key to success – is that you must want to do the subjects you finally choose to do. Students following a level 3 course normally select the equivalent of 3 subjects. This can be made up of 3 AS subjects or a double vocational award and a further A Level. In some cases if you are doing particularly well at GCSE we may advise you to study 4 subjects. We can help you make this decision at your interview. We have a number of Btecs which have a majority of coursework along with some exams. GCSE retakes in English and Maths are also available for those students who still need to achieve the valuable grade C.
Think of your likely results in the summer and you will be able to see the types of courses you ought to be considering, in recognition of the needs of individual students the College reserves the right to vary the programme of study as appropriate. As you consider your Sixth Form options you need to ask yourself the following question: What level of qualification am I aiming for? What are the entry requirements for the Level of course I wish to study? Apart from the guidance given about levels and entry requirements you will also need to check the entry requirements for each of your chosen subjects. These entry requirements vary from subject to subject and are based on the experience of the Department in preparing students to successfully complete a course at Advanced or Intermediate level. It is not in your interest to embark on a course of study in the Sixth Form without the necessary qualifications to build on. What is required for success at Sixth Form? We know that the key to success at sixth form is centred on consistent, challenging hard work. Many of you may find that to succeed as a sixth form student you will need to work substantially harder than you did at GCSE. 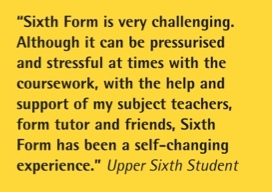 As you may know from talking to older students, Sixth Form study is significantly more challenging than GCSE and you will need commitment and resilience to succeed. Importantly, you will be expected to show far greater initiative in directing your own studies outside of the classroom. However, you should not be disheartened by this challenge, we see every year where students commit resolutely to their study they are typically very successful. What is especially valuable about developing independence as a learner now is that it will equip you with the skills you need to be successful at university or at work. The reality of the world beyond school is that you are expected to work incredibly hard without supervision. Therefore by developing those skills now you ensure your future success. •Read around and ahead in their subjects. •Seek advice from teachers and Year 13 students about books and online resources that are especially valuable. •Do their revision week by week (creating the revision notes and questions for each topic as they go through the course and not as a mad rush at the end). •Redo essays and assessments to improve them after getting feedback without being asked to do so. •Support their peers and work cooperatively. •Use their tutor time and independent time wisely to plan their learning and think ahead. •Organise their time carefully so that they meet all of their deadlines. •Attend lessons and revision sessions with questions and ideas ready to discuss having read ahead in advance. •Expect to find the work challenging, but realise that it is only through perseverance that you can succeed. As a Sixth Form it is our goal to support you to develop the independent skills and work ethic required to ensure you succeed. As you will see we are a supportive Sixth Form and we all commit to working hard to benefit each other. Your class teachers, the Sixth Form team and your tutor will all work together to help you manage your studies. In tutor time you will work to plan your learning for the weeks and months ahead. You are also strongly encouraged to work cooperatively with other students utilising the non-silent student places within the college. What are study periods and how are they used? Due to the essential importance of independent study all students in both years are given the option of doing only three subjects and having two fifths of the timetable available for extra study. You will, of course, be set lots of work to deadlines as you are used to from the lower school, but to succeed this will need to be supported by substantial independent work around your subjects. You use your directed study periods and your own time to do this . Your tutor will help guide you through this process so that you use your time constructively. It is important to note that there are no such things as ‘free periods’. You are at school for a working day, and while socialising is important this must occur in breaks and at lunch. At other times when you are not in timetabled lessons, you need to stay on site. You will likely want to work in one of the available work spaces and will need to choose which one is most suitable for how quietly you want to work. You can leave the site at lunchtime to go into Holwood for lunch. As you would expect all work must be completed by the deadline set. If you feel that deadlines are unrealistic you need to discuss this in advance with the person setting the work, just as you would in any place of business. In the unlikely event that you start to demonstrate a problem completing work to a suitable standard, it is likely that we will suggest that you increase the number of timetabled, supervised private study sessions you have. We may also suggest that you need timetabled supervised times when you are not otherwise timetabled. •We need to turn up to the lesson with all of the equipment we need to work effectively. •We can all expect everyone to listen quietly when someone else is talking. You cannot talk across the room. •The teacher may decide to move students around to facilitate learning. •Where a teacher will be late they will set work for you to do while you are waiting. •We cannot use phones in lessons. •The same is true of headphones- there is plenty of research that suggests that listening to music (except some classical music without lyrics) does not aid concentration. It may stop us from being distracted by other people, but we need to learn to do that anyway if we are to study successfully- using one smaller distraction to avoid a larger one is not the answer. •The register will be taken at the start of the lesson after which any students who arrive will be listed as late. If you are regularly late, we will need to look at the whole of your academic profile to decide on your future in sixth form. •In a double lesson, teachers may allow a short comfort break around half way through the lesson- this will not be longer than five minutes and we will not therefore have time to eat or be able to bring food back with us. It is up to the teacher to decide whether this kind of break will happen in any lesson. If you want to succeed in sixth form nothing is more important than attendance. Although you will do your best to catch up and staff will try to support you, nothing can replace actually being in lessons and results from previous years bear this out- students who miss lots of lessons do worst in exams. Because we know how important this is, we will monitor it, not just in your lessons but in every part of your learning this includes all subject lessons, tutorial sessions, assemblies and any other compulsory activity. It is your responsibility as students to get to every session and if that is not possible to get your parents to tell us as soon as you can. By the start of the first session that you are going to miss, your parents need to phone or send in a note. You should only plan absences from the college if there is no alternative arrangement available and the reason is valid/acceptable to the college. In these circumstances, you will need to provide details to Reception as soon as possible as well as providing supporting evidence before the event where possible. •A job interview (appointment letter must be provided). If you don’t tell us that you are going to be absent, this will show on the register as an unauthorised absence. We will tell your parents by an email or text message. We have to treat unauthorised absences very seriously and if a pattern of attendance problems develops, we will quickly put you on monitoring which could result in you being asked to leave. We have to do this because we know that if you start to regularly miss your lessons you have very little chance of succeeding in your exams and so are wasting your time being here. 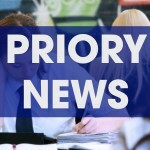 If you organise an unauthorised holiday during term time you are essentially excluding yourself from Priory and as with an excluded student you will need to have a reintegration meeting on your return to ensure that you are able to take your place up in the sixth form again. It is our expectation that you will be available to be in the college all day every day- from tutorial at 8.50 to the end of lessons at 3.00. During the day, you will have some supervised private study lessons which will be timetabled and then some lessons where it is up to you what you do- our advice is that you work during these also – you are expected to do at least five hours a week private study for each of your subjects, so you should not really have any free time left over during the day. If you are progressing well on your courses the head of year will authorise one early leave a week. If you need to go home partway through the day due to illness, you must see the Head of Year and sign out at Reception before leaving the college. We will inform your parents that you have left the college. How much can you be away? If your total attendance becomes too low, your form tutor will be expected to monitor your attendance until it improves. We do know that just one bout of illness in the first few weeks will lead to this happening, so we won’t overreact, but as the year progresses, anyone whose attendance is below 95% is statistically likely to underachieve. This is unfortunately the case even when the absence is because of genuine illness. If your attendance continues to be a concern we will ask you and your parents to attend an interview. You will be set targets to allow you to continue in the sixth form. If your attendance still fails to improve, it is likely that you will be asked to leave. Good attendance is about attitude. Obviously, some students are likely to have real illnesses which will result in them being away – we will always be sympathetic if this is the case and support you as you try to catch up with work missed. Unfortunately there is no getting away from the fact that some students have worse attendance in the sixth form than they had lower down in school – there is no medical reason that we know of why being 17/18 makes you more ill! You need to treat sixth form as you would a job – if you are away too often from work, they will sack you and we will do the same. If you don’t like some parts of the day in your job, you would never get away with missing them and just turning up for the things you do like- the same is true here. There is plenty of evidence which you will be shown which demonstrates an exact match between the attendance of students and the results that they finally get. It is therefore really important that we help you to be here as much as you possibly can. If you are ill, your parents or guardians will need to phone the attendance line on each day that you are going to be away so that we can authorise your absence. Unfortunately, even when there are very good reasons for absence, it is still almost certain that there will be an effect on your final results if you are away a lot- it is your responsibility, therefore, to be proactive about finding out what you have missed so that you can reduce these effects. As we mentioned before, this is your place of work and the processes we use to monitor absence are essentially the same for staff and students. If your level of absence starts to worry us and certainly if it dips below 90%, we will monitor it closely and are likely to start some kind of attendance contract for you. In work, if you are absent repeatedly, you are likely to be sacked and unfortunately each year we have to ask students to leave as a result of poor attendance. It is also worth mentioning here that most jobs that you might go for in the next few years will ask for a reference from us and almost all of these ask for an attendance percentage which we obviously are not allowed to make up. We know of ex students who have not got jobs because we could not lie for them about this. Smoking is not permitted at all in the college or on the path between the buildings regardless of age. This is a legal requirement. As a college we have a responsibility to provide a safe and healthy learning environment that we believe everyone deserves. If you are seen smoking this would be a very serious matter and you would therefore be required to leave the college site and return home. Unfortunately it is not always possible to identity a smoker amongst a group of people. Therefore if you are in the company of a smoker we would have no choice but to treat you all, as a group, equally. All of the above rules also apply equally to E-Cigarettes. During lesson times, we need to move around the site with respect for the classes going on- this means that we should be quiet and respectful of the learning environment. Eg: In public areas such as reception, the canteen and the corridors, we all benefit if there is a calm and purposeful atmosphere. We must not swear or behave otherwise aggressively and our behaviour towards other members of the sixth form community should be respectful. We will not tolerate any behaviour that is disrespectful to others such as gender specific harassment or homophobic comments. Students are not permitted to work during the college day, including period 5. Sixth Formers should be very busy with their academic work, and so a limit of 12 hours of paid work outside of the college is sensible. Students are not permitted to have driving lessons during the college working day. However, an exception is made for driving tests, including theory tests as these are often impossible to rearrange. Evidence may be required to demonstrate this. We are very keen that you should get a chance to do work experience if it might be useful to you during the course of the year and the work experience co-ordinator will be talking to the year group about how to arrange it. Some students may find that health problems or disabilities may affect studies and we may be able to help with by providing in-class support or extra subject support. A confidential counselling service is available for students in the Sixth Form. Counselling offers the opportunity to think and talk about specific problems and look at ways to address issues. Ms Hannah is able to discuss any questions students may have about their long term career path. The College and staff have a general duty to ensure the safety and protection of vulnerable students under 18 years of age who are suffering, or who are likely to suffer, significant harm. This duty also extends to vulnerable students over 18 years old. Staff have received training in recognising students who may be at risk and need support and the College works closely with other external agencies to support students who may experience difficulties.